I have an Apple Watch Series 4 and I love it. The display is awesome and the integration with the iPhone is fantastic. 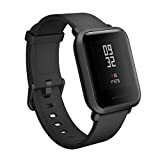 But there’s another smartwatch I’ve been using off and on for about a year now called the Amazfit Bip Smartwatch by Huami, and I often recommend it to people over the Apple Watch for four main reasons. First, it works with Android and the Apple Watch obviously isn’t an option for people with Android phones. Second, it supports sleep tracking and all-day heart rate tracking, which the Apple Watch does not. Third, it lasts for up to a whopping 30 days on a single charge — you’re lucky if you get 18 hours out of an Apple Watch. And finally, it costs just $80 instead of hundreds or even $1,000+.